The series of articles "Casino Poker for Beginners" is intended for people who have played poker online and/or in home games, but have little or no experience playing in a “brick-and-mortar” or at an online casino. Casinos have rules, procedures, and points of etiquette that can trip up players on their first few visits — or at least confuse and mystify them. I hope to explain these to you in advance so that you don’t get intimidated or embarrassed. Understanding them might also keep you from losing money by inadvertently breaking a rule during the game. The articles in this series will focus specifically on how poker in casinos differs from what you have learned from playing casino poker games like three-card poker online or at friends’ home games, particularly in what might be termed its “procedural” aspects. I work from the assumption that readers have enough experience under their belts at one or both of those other types of poker games to feel comfortable playing them and would like to try adding casino poker to their repertoire. For this first installment, I’ll give you a step-by-step guide for getting into a cash game. 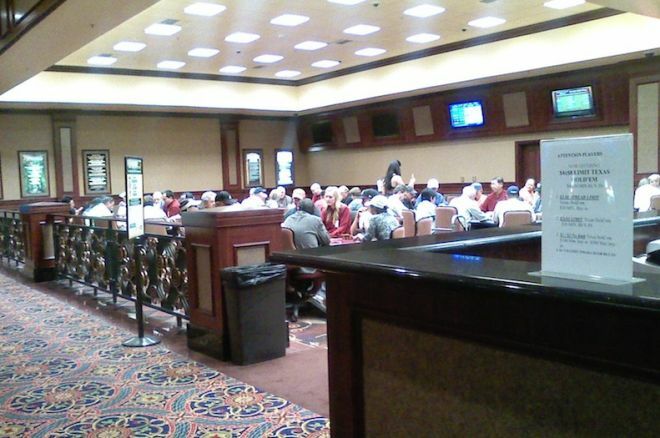 I’ll cover entering a casino poker tournament in a later column. So you’ve taken the trip to Las Vegas, Atlantic City, Tunica, Los Angeles, or any of the other many poker destinations that are now available in the U.S. and around the world. 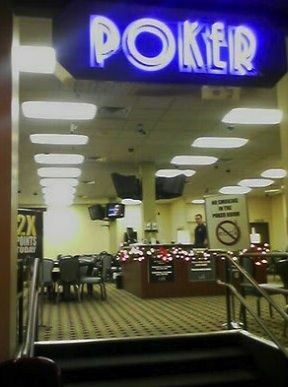 You’ve selected which poker room to patronize. Now what? Your first step is to know what games are available. Poker rooms vary in how they communicate game availability to would-be players. Most now have a large-screen TV listing the games and the names of any people waiting to play. Some use a manually updated white board. Often you’ll see a number in parentheses after such listings, which tells you how many tables of each game are in play. Some places display the actual table numbers. (Each table in a poker room has a fixed identification number.) If there are names under the game heading, that tells you who is waiting to play. The stakes of the game are communicated by the pair of numbers in front of the name of the game. Confusingly, the numbers mean different things for different games. In hold’em and Omaha (i.e., the so-called “flop games”), fixed-limit games are named by the size of the bets you can make. For example, “4-8 limit hold’em” means that the bets and raises are each $4 for the first two betting rounds of each hand (before the flop and on the flop), and $8 on the turn and river. The blinds in these games are typically one-half of those values, or $2 and $4 in this example, though some casinos use different structures. Stud games (and draw games, if you can ever find one) follow the same convention — the numbers in the name of the game represent allowable bet sizes. But just when you think you understand that, you discover that no-limit games are listed differently. “1-2 no-limit hold’em” does not mean that the bets are $1 and $2 — that would violate the whole concept of a “no-limit” structure. Instead, these games are named by the size of the two blinds, in this case the small blind being $1 and the big blind $2. To make it even more confusing, a few casinos — most notably the largest ones in southern California — eschew the conventions I’ve just described in favor of a bewildering hodge-podge of buy-ins and blinds as the titles of their games. For example, a “$40 NL” game will mean no-limit hold’em with buy-in of exactly $40 — no more and no less — with blinds unstated but understood to be $1 and $2. There are other variations used in these places that are too numerous to detail here. But don’t worry — just tell them that it’s your first time there, and they’ll be happy to explain what the words, numbers, and abbreviations mean. Just about everywhere else, the explanations above will serve you well. Okay, so let’s say you’ve decided which of the offered games you’d like to play. Now just approach the person poised to greet you at the entrance to the poker room and tell him or her what you’re interested in. You will either be put on the waiting list for a opening, or, if you’re lucky, directed or escorted directly to a vacant seat in an active game. If you have to wait, be sure that you don’t wander off to someplace where you can’t hear your name being called. Some poker rooms now offer to call or text your cell phone when it’s your turn, in which case you’re free to go do something else while you wait. However, I think it’s a better idea to stick around and watch (from a respectable distance) a game of the type you plan to play, in order to get a sense for what’s happening. Next you’ll need to convert some cash into chips. But how much? The amount for which you can or must buy in to a game is related to the sizes of the blinds and/or bets, but not in any obvious or standardized way. Most commonly, the buy-in is capped at 100, 150, or 200 times the amount of the big blind in no-limit games. However, you can find poker rooms with substantially smaller buy-in caps, and some with no caps at all. There’s no reliable way to figure this out on your own; you just have to ask an employee. Limit games are often officially uncapped, but you’d be looked at oddly if you bought into a fixed-limit game for more than about 50 big blinds, because stack sizes are not usually an important factor in how the game plays. Let’s suppose you’re going to play $2/$4 limit hold ’em, and you’ve decided to buy in for the maximum this casino allows for this game, which is, say, $200. There are four different ways you might exchange your cash for poker chips. The person at the front podium who signs you in might also serve as the room’s cashier. He or she might direct you to a separate cashier’s “cage” to purchase chips. You might be instructed to buy your chips from the dealer when you sit down. After you take your seat, they might have a “chip runner” take your money and bring you chips. Again, which method a given place uses (and it can change depending on how busy they are) is not usually obvious, even to experienced players — you just have to ask. Congratulations! You’re past the first set of hurdles, and seated in your first casino poker game, with a fresh stack of chips stacked neatly in front of you. In the next “Casino Poker for Beginners” entry, I’ll start to delve into what the casino expects of you as a player at one of its tables.